It has been described as an "unbreakable" record. In 1939, Tommy Godwin rode 75,065 miles in a single year to set an endurance riding record that some believe will never be beaten. In fact, he kept on going until 14 May 1940, setting the record for the time taken to ride 100,000 miles. Born in Stoke-on-Trent in 1912, Godwin would have celebrated his 100th birthday this year. But unfortunately, Godwin's record is now largely forgotten. The Year Record has fallen out of fashion and is no longer the coveted cycling achievement it used to be. Imagine spending every day in the saddle for 18 hours, covering over 200 miles, repairing any mechanical failures, picking yourself up after crashes and then riding even further the next day to make up lost time. The distance is the equivalent of three times around the world in a single year, or riding from John O'Groats to Land's End and back every week. It was all achieved on a heavy steel bike with only four gears. Yet more than 70 years later, the record still stands. "It's those statistics that make the record virtually unbreakable," said Dave Barter, a keen cyclist who is writing a book about the Year Record. "I've gone through his mileage diaries and painstakingly recreated each day's mileage into a spreadsheet. "Sometimes he survived on four hours' sleep and there were probably days when he didn't even bother and just carried on and kipped in a field for an hour. "He pushed it [the record] beyond the limit of any mere mortal. "I worked with a guy who tried it again this year - he lasted about a month and a half. "The essence of it is that for a year you have to completely give up your whole life. "When I tell other cyclists about the record, they simply don't believe it's possible." Godwin's daughter, Barbara Ford, described her father as "hard as nails" but also said that he was really "a big softie". "There was nothing he wouldn't tackle or do, and nothing he wouldn't do to help anyone." "At 14, he used to ride a bike in a pair of shoes he'd borrowed from the lady next door. "He'd get on an iron-framed butcher's bike and cycle a road race of 25 miles and win it. "He never bragged or told anyone. He was so unassuming and didn't want any fuss. "He once saved a woman from a fire, and after checking she was ok, he simply got on his bike and carried on riding. "All his cups and trophies, he gave away. It wasn't that he was ungrateful - he just didn't need any recognition. "When they unveiled a plaque in his honour someone asked me what my dad would have said. I told them he wouldn't have turned up. "Everyone should have had the privilege of meeting Tommy Godwin, because he was just so lovely. "I remember asking him why he attempted the record. "He did it just because he loved cycling so much. "Guinness did say that my dad's record would always be safe. They won't accept a challenge because they think it's too dangerous." There are also issues over verification: it would be all too easy for a rider these days to swap a tracking unit with other riders. Tracking devices did not exist in 1939, so Godwin's mileage was verified by respected figures such as police officers, and posted daily to Cycling - the magazine that originally set up the challenge. 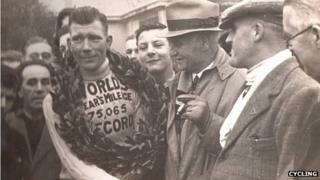 Stoke-on-Trent cycling legend Brian Rourke said: "In theory, the record should be breakable because new road surfaces and modern bikes offer a huge advantage. "They can do 500 miles in a day now. But to do over 200 miles, every day for a year, on a three-speed bike made of steel, is basically impossible. "Nobody could ever match his record. Even if it was broken, the conditions just aren't comparable." After the feat, Godwin had to learn to walk normally again and uncurl his hands. Yet within weeks, he was serving his country in the RAF. "I honestly don't know how he did it. His constitution is just unimaginable," said Mr Rourke. "He is totally unique - someone the world will never see the likes of again."